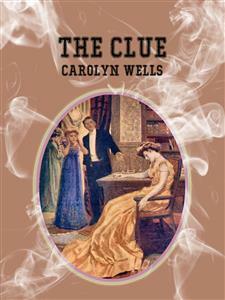 The Clue written by Carolyn Wells who was an American writer and poet. This book was published in 1909. And now republish in ebook format. We believe this work is culturally important in its original archival form. While we strive to adequately clean and digitally enhance the original work, there are occasionally instances where imperfections such as missing pages, poor pictures or errant marks may have been introduced due to either the quality of the original work. Despite these occasional imperfections, we have brought it back into print as part of our ongoing global book preservation commitment, providing customers with access to the best possible historical reprints. We appreciate your understanding of these occasional imperfections, and sincerely hope you enjoy reading this book. The Man pointed toward the Table. The old Van Norman mansion was the finest house in Mapleton. Well back from the road, it sat proudly among its finely kept lawns and gardens, as if with a dignified sense of its own importance, and its white, Colonial columns gleamed through the trees, like sentinels guarding the entrance to the stately hall. All Mapleton was proud of the picturesque old place, and it was shown to visiting strangers with the same pride that the native villagers pointed out the Memorial Library and the new church. More than a half-century old, the patrician white house seemed to glance coldly on the upstart cottages, whose inadequate pillars supported beetling second stories, and whose spacious, filigreed verandas left wofully small area for rooms inside the house. The Van Norman mansion was not like that. It was a long rectangle, and each of its four stories was a series of commodious, well-shaped apartments. And its owner, the beautiful Madeleine Van Norman, was the most envied as well as the most admired young woman in the town. Magnificent Madeleine, as she was sometimes called, was of the haughty, imperious type which inspires admiration and respect rather than love. An orphan and an heiress, she had lived all of her twenty-two years of life in the old house, and since the death of her uncle, two years before, had continued as mistress of the place, ably assisted by a pleasant, motherly chaperon, a clever social secretary, and a corps of capable servants. The mansion itself and an income amply sufficient to maintain it were already legally her own, but by the terms of her uncle’s will she was soon to come into possession of the bulk of the great fortune he had left. Madeleine was the only living descendant of old Richard Van Norman, save for one distant cousin, a young man of a scapegrace and ne’er-do-weel sort, who of late years had lived abroad. This young man’s early life had been spent in Mapleton, but, his fiery temper having brought about a serious quarrel with his uncle, he had wisely concluded to take himself out of the way. And yet Tom Willard was not of a quarrelsome disposition. His bad temper was of the impulsive sort, roused suddenly, and as quickly suppressed. Nor was it often in evidence. Good-natured, easy-going Tom would put up with his uncle’s criticism and fault-finding for weeks at a time, and then, perhaps goaded beyond endurance, he would fly into a rage and express himself in fluent if rather vigorous English. For Richard Van Norman had been by no means an easy man to live with. And it was Tom’s general amiability that had made him the usual scapegoat for his uncle’s ill temper. Miss Madeleine would have none of it. Quite as dictatorial as the old man himself she allowed no interference with her own plans and no criticism of her own actions. This had proved the right way to manage Mr. Van Norman, and he had always acceded to Madeleine’s requests or submitted to her decrees without objection, though there had never been any demonstration of affection between the two. But demonstration was quite foreign to the nature of both uncle and niece, and in truth they were really fond of each other in their quiet, reserved way. Tom Willard was different. His affection was of the honest and outspoken sort, and he made friends easily, though he often lost them with equal rapidity. On account, then, of his devotion to Madeleine, and his enmity toward young Tom Willard, Richard Van Norman had willed the old place to his niece, and had further directed that the whole of his large fortune should be unrestrictedly bestowed upon her on her wedding-day, or on her twenty-third birthday, should she reach that age unmarried. In event of her death before her marriage, and also before her twenty-third birthday, the whole estate would go to Tom Willard. It was with the greatest reluctance that Richard Van Norman decreed this, but a provision had to be made in case of Madeleine’s early death, and Willard was the only other natural heir. And now, at twenty-two, Madeleine was on the eve of marriage to Schuyler Carleton, a member of one of the oldest and best families of Mapleton. The village gossips were pleased to commend this union, as Mr. Carleton was a man of irreproachable habits, and handsome enough to appear well beside the magnificent Madeleine. He was not a rich man, but, as her marriage would bring her inheritance, they could rank among the millionaires of the day. Yet there were those who feared for the future happiness of this apparently ideal couple. Mrs. Markham, who was both housekeeper and chaperon to her young charge, mourned in secret over the attitude of the betrothed pair. And that was true enough. Madeleine had inherited the Van Norman traits of dignity and reserve to such an extent that it was difficult for any one to be a really close friend. She had, too, a strange little air of preoccupation, and even when interested in a conversation would appear to look through or beyond her companion in a way that was discouraging to the average caller. And now that she was about to marry Schuyler Carleton, the event of the wedding was the only thing talked of, thought of, or dreamed of by Mapleton society. Madeleine, who always kept in touch with Tom Willard by correspondence, had written him of her approaching marriage, and he had responded by coming at once to America to attend the ceremony. Relieved from the embarrassment of his uncle’s presence, Tom was his jovial self, and showed forth all the reprehensible attractiveness which so often belongs to the scapegrace nature. He sometimes quarreled with Madeleine over trifles, then, making up the next minute, he would caress and pet her with the privileged air of a relative. He was glad to be back among the familiar scenes of Mapleton, and he went about the town renewing old acquaintances and making new ones, and charming all by his winning personality. In less than a week he had more friends in the village than Schuyler Carleton had ever made. Carleton, though handsome and distinguished-looking, was absolutely without personal magnetism or charm, which traits were found in abundance in Tom Willard. The friends of Schuyler Carleton attributed his reserved, almost repellent demeanor to shyness, and this was partly true. His acquaintances said it was indifference, and this again, was partly true. Then his enemies, of whom he had some, vowed that his cold, curt manner of speech was merely snobbishness, and this was not true at all. His manner toward his fiancée was all that the most exacting could require in the matter of courtesy and punctilious politeness. He was markedly undemonstrative in public, and if this were true of his behavior when the two were alone, it was probably because Madeleine herself neither inspired nor desired terms or acts of endearment. Tom’s attitude toward Madeleine angered Carleton extremely, but when he spoke to her on the subject he was gaily informed that the matter of cousinly affection was outside the jurisdiction of a fiancée. Tom, on his part, was desperately in love with Madeleine, and had been for years. Repeatedly he had begged her to marry him, and she knew in her heart that his plea was prompted by his love for herself and not by any consideration of her fortune. And yet, should she marry another, all hope of his uncle’s money would be forever lost to Tom Willard. But prodigal and spendthrift that he was, if Tom felt any regret at his vanishing fortunes, he showed no sign of it. Save for sudden and often easily provoked bursts of temper, he was infectiously gay and merry, and was the life of the house party already gathered under Madeleine’s roof. The fact that Tom was staying at the Van Norman house, which of course Carleton could not do, gave Willard an advantage over the prospective bridegroom, of which he was by no means unconscious. Partly to tease the imperturbable but jealous Carleton, and partly because of his own affection for his cousin, Tom devoted himself assiduously to Madeleine, especially when Carleton was present. Then he would tuck her arm through his own, and take her for a stroll in the grounds, and Carleton, coming to search for her, would find them cosily chatting in a secluded arbor, or drifting lazily in a canoe on the tiny, lily-padded lake. These things greatly annoyed Schuyler Carleton, but remonstrance was never an easy task for him, nor did it ever affect Madeleine pleasantly. Magnificent Madeleine looked straight at him, tilting her head back slightly to look beneath her half-closed lids. Though Schuyler Carleton may not have been lavish of affection, he begrudged no admiration to the splendid woman he had won. And yet, had he but known it, the apparently scornful and haughty girl was craving a more tender and gentle love, and would gladly have foregone his admiration to have received more affection. Yet Madeleine herself was chummy with nobody save Tom. They two were always chatting and laughing together, and though they differed sometimes, and even quarrelled, it was quickly made up, and forgotten in a new subject of merry discussion. But, after all, they rarely quarrelled except regarding Madeleine’s approaching marriage. “What do you mean?” exclaimed Madeleine angrily. Madeleine turned on him, her eyes blazing with anger. “Small need! You know why as well as I do;” and Tom pushed his hands into his pockets and strode away, whistling, well knowing that he had roused his cousin’s even temper at last. In addition to some of her Mapleton friends, Madeleine had invited two girls from New York to be her bridesmaids. Kitty French and Molly Gardner had already come and were staying at the Van Norman house the few days that would intervene before the wedding. Knowing Madeleine well, as they did, they had not expected confidence from her, nor did they look forward to cosy, romantic boudoir chats, such as many girls would enjoy. But neither had they expected the peculiar constraint that seemed to hang over all the members of the household. Mrs. Markham had been so long housekeeper, and even companion, for Madeleine that she was not looked upon as a servant, and to her Kitty French put a few discreet questions regarding the exceeding reserve of Mr. Carleton. “You know Mr. Willard is in love with Maddy,” suggested Miss French. Like many people, Mrs. Markham emphasized by repetition a statement of whose truth she was far from sure. The day before the wedding the old house was a pleasant scene of bustle and confusion. Professional decorators were in charge of the great drawing-room, building a canopy of green vines and flowers, beneath which the bridal pair should stand the next day at high noon. This work was greatly hindered by a bevy of young people who thought they were helping. It was nearly five o’clock, and the girls found most of the house guests already assembled in the library, awaiting the arrival of the tea-tray. Several other young people were there also, most of them being those who were to be of the wedding cortège next day. Robert Fessenden, who was to be best man, had just come from New York, and had dropped in to see Miss Van Norman. Although he was an old friend of Carleton’s, Madeleine did not know him very well, and though she made him welcome, it was with that coldly formal air that did not greatly attract the young man, but he could not fail to be impressed by her great beauty. “All?” Fessenden’s tone was quizzical. “What do you mean?” asked Tom sharply. “She is so,” said Tom, heartily, which was kind of him, considering his own opinion of Carleton. And then both men strolled over to where Madeleine sat at the tea-table. She was reading a telegram that had just been brought to her, and she laughingly explained to Tom that it meant a bother for him. This reference to the tall and stately mistress of the house raised a general laugh, but Madeleine did not join in it. As Tom spoke he put his arm carelessly round Madeleine’s shoulders, and though scarcely more than a cousinly caress, it was unfortunate that Schuyler Carleton should enter the room at that moment. A lightning glance flashed between the two men, and as Tom moved away from Madeleine with a slightly embarrassed shrug of his shoulders, Carleton’s face grew so stern that an uncomfortable silence fell upon the guests. However, the arrival of the tea-tray saved the situation, and Madeleine at once busied herself in the pretty occupation of serving tea to her guests. With an air of jealous proprietorship, Carleton moved toward her and, looking handsome, though sulky, stood by Willard with folded arms, as if on guard. Urged on by a daredevil spirit of mischief, and perhaps remembering that Madeleine would soon be beyond his reach as Carleton’s wife, Tom also moved toward her from the other side. Endeavoring to treat the situation lightly, Madeleine held up a newly-filled teacup. “Who will have this?” she asked gaily. “I will!” declared Carleton and Tom at the same time, and each held out a hand. Madeleine looked at them both smilingly. Carleton’s face was white and set; he was evidently making a serious matter of the trifling episode. Tom, on the contrary, was smiling broadly, and was quite evidently enjoying his rival’s discomfiture. But Carleton would not fall in with her light mood. Though not rude in themselves, the words were accompanied by a harsh and disdainful glance that made several of the onlookers wonder what sort of a life the haughty Madeleine would lead with such a coldly tyrannical husband. Suddenly Madeleine’s mood changed to one of utter gaiety. She smiled impartially on all, she jested with the girls, she bewitched the young men with her merry banter, and she almost seemed to be flirting with Tom Willard. But he was her cousin, after all, and much is forgiven a bride-to-be on her wedding eve. Robert Fessenden looked at Miss Van Norman with a puzzled air. He couldn’t seem to understand her, and was glad when by chance the two were left comparatively alone for a few moments’ conversation. “You’re a very intimate friend of Mr. Carleton’s, aren’t you?” said Madeleine, with a strange note of wistfulness in her voice. Rob Fessenden was thrilled by the plaintive expression on the beautiful face, and suddenly felt a great desire to help this girl, who was seemingly so far above and beyond all need of help, and yet was surely about to ask his aid, or at least his sympathy. “I can’t—I can’t,” Madeleine whispered, and her voice was almost a moan. “Do you know Dorothy Burt?” Madeleine then broke out, as if the words were fairly forced from her. As Fessenden watched Madeleine, she changed swiftly from a perturbed, troubled girl to a courteous, polished hostess. Miss Morton was a tall, angular lady, with gray hair and sharp, black eyes. She seemed to bite off her words at the ends of her short sentences, and had a brisk, alert manner that was, in a way, aggressive. “An eccentric,” Rob Fessenden thought, as he looked at her, and wondered why she was there at all. “As the Carletons will,” said Fessenden, smiling. After tea all the callers departed, and those who were house guests went to their rooms to dress for dinner. Tom Willard, with great show of burlesque regret and tearful farewells, went to the hotel, that Miss Morton might have the room he had been occupying. He promised to return for dinner, and gaily blew kisses to Madeleine as with his traps he was driven down the avenue. At dinner, Schuyler Carleton’s place was vacant. It had been arranged next to Madeleine’s, and when fifteen minutes after the dinner hour he had not arrived, she haughtily accepted Tom Willard’s arm and led the way to the dining-room. But having reached the table, she directed Tom to take his rightful seat, at some distance from her own, and Carleton’s chair remained empty at Madeleine’s side. At first this was uncomfortably evident, but Madeleine was in gay spirits, and soon the whole party followed her lead, and the conversation was general and in a merry key. The young hostess had never looked more regally beautiful. Her dark hair, piled high on her head, was adorned with a dainty ornament which, though only a twisted ribbon, was shaped like a crown, and gave her the effect of an imperious queen. Her low-cut gown of pale yellow satin was severe of line and accented her stately bearing, while her exquisitely modelled neck and shoulders were as white and pure as those of a marble statue. Save for a double row of pearls around her throat, she wore no ornaments, but on the morrow Carleton’s gift of magnificent diamonds would grace her bridal costume. The combination of haughty imperial beauty and a dazzling witchery of mood was irresistible, and the men and girls alike realized that never before had Madeleine seemed so wonderful. After the dessert was placed on the table, Willard could stand it no longer, and, leaving his own place, he calmly appropriated Carleton’s vacant chair. Mrs. Markham overheard the quotation, and a look of pain came into her eyes. But it was all too late now, and to-morrow Madeleine would be irrevocably Schuyler Carleton’s wife. After dinner coffee was served in the cozy library. Madeleine preferred this room to the more elaborately furnished drawing-room, and to-night her word was law. But suddenly her mood changed. For no apparent reason her gay spirits vanished, her smile faded away, and a pathetic droop curved the corners of her beautiful mouth. “I’m quite ready to go,” declared Kitty French with some tact, for she saw that Madeleine was nervous and strung up to a high tension. “I, too,” exclaimed Molly Gardner, and the two girls said good-night and went upstairs. Madeleine said good-night to him kindly enough, but without jest or gaiety. Tom looked at her curiously for a moment, and then, gently kissing her hand, he went away. Mrs. Markham, having seen Miss Morton comfortably installed in what had been Tom’s room, returned to the library to offer her services to Madeleine. A few moments later Cicely Dupuy came in, bringing some letters and papers. She was Miss Van Norman’s private secretary, and admirably did she fill the post. Quick-witted, clever, deft of hand and brain, she answered notes, kept accounts, and in many ways made herself invaluable to her employer. Moreover, Madeleine liked her. Cicely was of a charming personality. Small, fair, with big, childish blue eyes and a rose-leaf skin, she was a pretty picture to look at. “Very well, Miss Van Norman,” said Cicely, and, taking the lists she had made, she went softly from the room. The loud cry of a single word was not repeated, but repetition was unnecessary, for the sound rang through the old Van Norman house, and carried its message of fear and horror to all, awake or sleeping, within its walls. It was about half-past eleven that same night, and Cicely Dupuy, still fully dressed, flew from her bedroom out into the hall. Seeing a light downstairs, and hearing the servants’ bells, one after another, as if rung by a frantic hand, she hesitated a moment only, and then ran downstairs. In the lower hall Schuyler Carleton, with a dazed expression on his white, drawn face, was uncertainly pushing various electric buttons which, in turn, flashed lights on or off, or rang bells in distant parts of the house. For a moment Cicely stared straight at the man. Their eyes met, their gaze seemed to concentrate, and they stood motionless, as if spellbound. This crisis was broken in upon by Marie, Madeleine’s French maid, who came running downstairs in a hastily donned negligée. With a start, Carleton turned from Cicely, and still with that dazed look on his face, he motioned Marie toward the wide doorway of the library. The girl took a step toward the threshold, and then, with a shriek, paused, and ventured no further. Cicely, as if impelled by an unseen force, slowly turned and followed Marie’s movements, and as the girl screamed, Cicely grasped her tightly by the arm, and the two stood staring in at the library door. What they saw was Madeleine Van Norman, seated in a chair at the library table. Her right arm was on the table, and her head, which had fallen to one side, was supported by her right shoulder. Her eyes were partly closed, and her lips were parted, and the position of the rigid figure left no need for further evidence that this was not a natural sleep. But further evidence there was. Miss Van Norman still wore her yellow satin gown, but the beautiful embroidered bodice was stained a dull red, and a crimson stream was even then spreading its way down the shimmering breadths of the trailing skirt. On the table, near the outstretched white hand, lay a Venetian dagger. This dagger was well known to the onlookers. It had lain on the library table for many years, and though ostensibly for the purpose of a paper-cutter, it was rarely used as such. Its edges were too sharp to cut paper satisfactorily, and, moreover, it was a wicked-looking affair, and many people had shuddered as they touched it. It had a history, too, and Richard Van Norman used to tell his guests of dark deeds in which the dagger had taken part while it was still in Italy. Madeleine herself had had a horror of the weapon, though she had often admitted the fascination of its marvellous workmanship, and had said upon several occasions that the thing fairly hypnotized her, and some day she should kill herself or somebody else with it. From an instinctive sense of duty, Marie started forward, as if to help her mistress, then with a convulsive shudder she screamed again and clasped her hands before her eyes to shut out the awful sight. Cicely, too, moved slowly toward the silent figure, then turned and again gazed steadfastly at Schuyler Carleton. There must have been interrogation in her eyes, for the man pointed toward the table, and Cicely looked again, to notice there a bit of paper with writing on it. She made no motion toward it, but the expression on her face changed to one of bewildered surprise. Before she had time to speak, however, the other people of the house all at once began to gather in the hall. Mrs. Markham came first, and though when she saw Madeleine she turned very white and seemed about to faint, she bravely went at once toward the girl, and gently tried to raise the fallen head. She felt a firm grasp on her shoulder, and turned to see Miss Morton, with a stern, set face, at her side. “But she’s dead,” declared Mrs. Markham, at the same time bursting into violent sobs. “We do not know; we hope not,” went on Miss Morton, and without another word she led Mrs. Markham to a sofa, and sat her down rather suddenly, and then went herself straight to the telephone. As she reached it she paused only to inquire the name of the family physician. Harris, the butler, with difficulty articulated the name of Doctor Hills and his telephone number, and without further inquiry Miss Morton called for him. Miss Morton hung up the receiver and turned to the frightened group of servants.